Thank you for your Senate amendment advocacy! The Senate budget is now finalized. The Senate budget is now finalized. 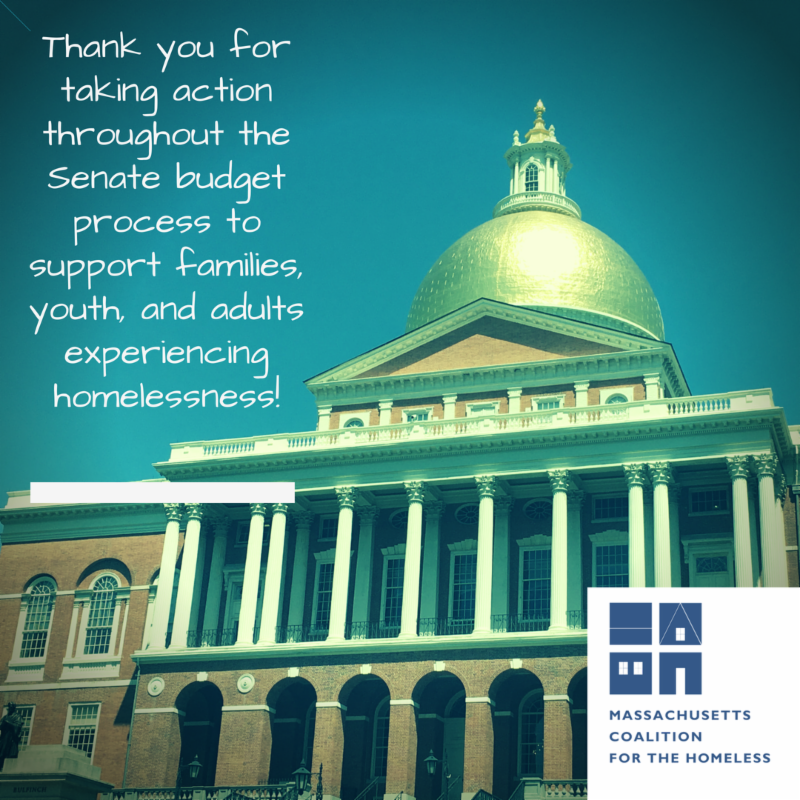 Thank you for your advocacy on key homelessness amendments to the FY'19 Senate budget! Early this morning, the State Senate completed the debate on their version of the state's FY'19 budget. Throughout the three full days of debate, the Senate added many language changes and $75.5 million in additional funding, bringing their recommended budget up to $41.49 billion. Late last night the Senate unanimously passed the Emergency Assistance amendment, 38-0! See Roll Call #408 above and read more about that amendment and our other two key amendments below. Amendment outcome: Unfortunately, this amendment was rejected, but the language still is alive for the Conference Committee deliberations, as it was included in the House version of the budget. We will share next steps soon. Please thank your Senator if they are listed in the amendment link above as a cosponsor. Special thanks to Senator Jehlen for strenuously advocating for the amendment and related EAEDC bill, Senate Bill 2039 . The State House switchboard number is 617-722-2000. You also can look up who your Senator is via www.wheredoivotema.com . Our Senate amendment page has more details. Please let us know if you receive any feedback from your Senator in response to your outreach. Thank you again for your advocacy-- online, over the phone, and in-person. Your actions will strengthen access to homelessness prevention resources, housing, and benefits!